views of the golf course, mountains and swaying palm trees! the perfect choice for a relaxing dream vacation! I'm a firefighter in Orange County, CA, and my wife is a speech pathologist in the public schools. We love staying at our villa and always feel like we're on vacation when we are here. If you want a relaxing spot to stay, you don't need to look any further! Rear private balcony overlooks several fairways and the local mountains to the north. Fully furnished dishes, glassware, utensils, cooking pots and pans, crockpot, etc. This condo is an upstairs unit with a north facing balcony. The view from the balcony, living room, and master bedroom is awesome. The condo is very comfortable. Bedding and furniture is nice, and the kitchen is well stocked with cooking supplies, dishes, and utensils. The condo rental includes use of the garage. Mark, the owner, is an awesome host. If anything stops working, Mark is very responsive and gets things fixed. I just can't say enough good things about this condo and owner. 5+ stars! Loved our stay at Mark and Michelle's condo! Spacious, quiet, comfortable and well-equipped with eveything necessary. We enjoyed having the 2 bikes available for touring the beautiful grounds. Loved BBQing on the private deck overlooking the golf course and gorgeous mountain views. Mark was quick to respond to any issue that arose and it was dealt with immediately. Thanks for a great stay! Deana & Barry A.
Deana and Barry were wonderful guests and took very good care of our villa. If anything needed our attention, they were quick to communicate with us. We enjoyed hosting them and would welcome them back any time! Palm Desert in the winter is awesome! Mark and Michelle, the owners of this condo on the golf course, are the perfect hosts. They provide a clean, well-stocked, well cared for unit. The patio of this upstairs condo affords beautiful views across the golf course to the mountains north of the Coachella Valley. Access to the fitness facility and tennis and pickleball courts is included with the rental. The community has 23 pools and spas for your use as well. We have stayed at Mark and Michelle's condo for several years and will continue to come back. It's a great place with great hosts. Our guests, Kurt & Christine, are every rental owner's dream renters! They have stayed with us many times, and we'll consider ourselves extremely lucky if they keep coming back for a long time. Probably the best feeling one can have as a host is to have guests who give you no problems and who you have absolutely no worries about. Kurt & Christine take care of our place as if it were their own. If minor maintenance issues crop up, they just handle it - often, without even telling us about it. To top it all off, they are probably some of the nicest folks you could ever meet! Great location on golf course with a terrific view of the mountains. We thoroughly enjoyed our stay. A clean well appointed condo. Great location and very private with a nice view of the mountains. We had a query and Mark promptly and efficiently handled our request. Would we return- definitely. Thank you Mark and Michelle for a lovely visit. Brent & Sharman were wonderful guests! They promptly notified us when they discovered a minor maintenance issue so that we could address it, and they even tried to fix the problem themselves in order to save us the trouble of calling out a repair service. We would recommend them as guests to anyone, and we would be pleased to have them stay with us again! Perfect position overlooking the golf course. Comfortable, spacious, very quiet with spectacular views. We would like to come back. Mark is a thoughtful host. Roz & Roger were delightful guests, taking good care of our home and informing us of any items/minor issues that they thought we needed to know about. We would be very pleased to have them stay with us again anytime they come to visit from "across the pond"! 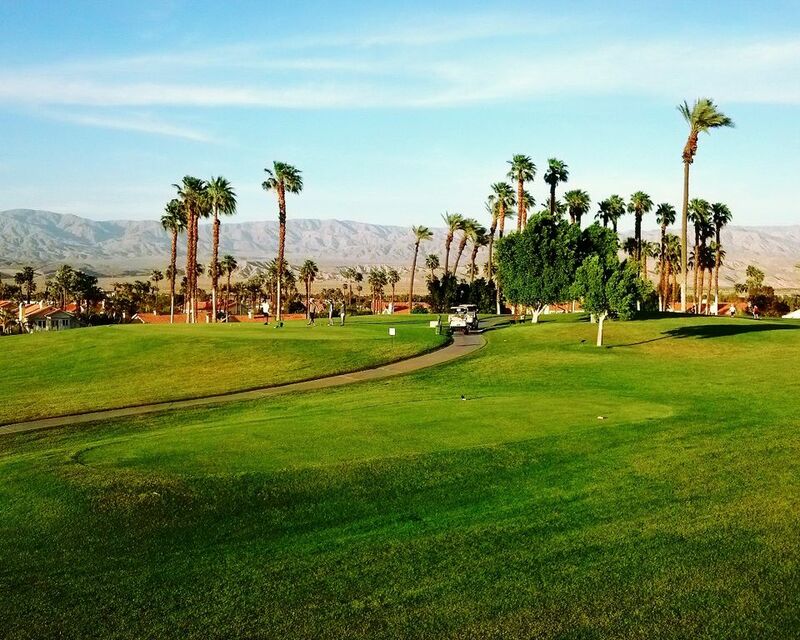 Located next to Marriott's Desert Springs Resort, the Desert Falls golf course is 18 holes and is rated one of the top 10 in the desert. 25 swimming pools, lighted tennis courts, raquetball, fitness center, game room, library, and beautiful clubhouse with restaurant are all located within the complex. Just minutes away is fabulous shopping, dining & entertainment along El Paseo Drive and The River at Rancho Mirage. Other nearby leisure activities include hiking, rock climbing, biking, wildlife viewing, horseback riding, live theater, cinemas, gaming casinos, Joshua Tree National Park, Knott's Soak City, and much more! First come, first served. Reservations are not confirmed until payment/deposit and signed rental agreement are received.